A reflection by Amelia Meman on her feminist mentoring relationship with Assistant Director Megan Tagle Adams. 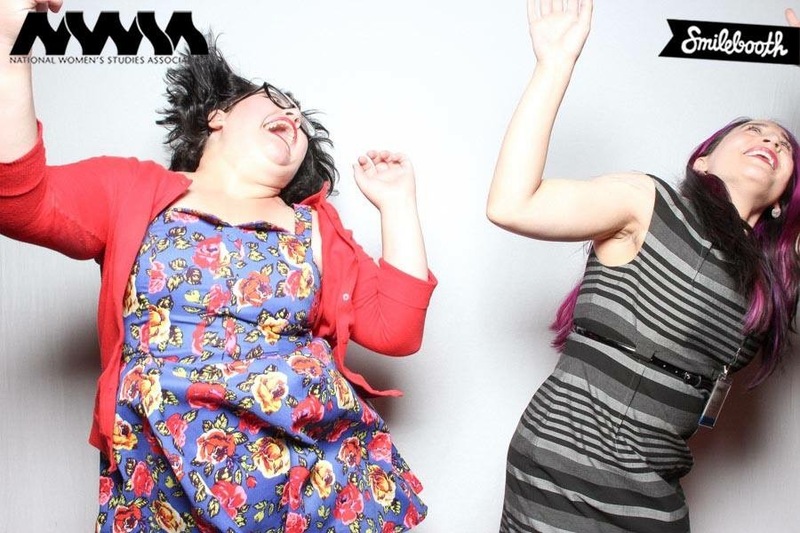 Megan (right) and I in the National Women’s Studies Association (NWSA) photobooth. With Megan’s departure from UMBC (today! ), I feel the Women’s Center is saying goodbye to a real social justice champion on our campus. Someone who was constantly striving for excellence in our institution. More than this, though, I feel I am saying goodbye to someone who has taught me what feminist mentorship—in its best iteration—can be. A short reflection by Shira Devorah, Women’s Center student staff. I bought my own copy of Dirty River (even though the Women’s Center has a copy you can loan now thanks to the UMBC’s LGBTQ Faculty & Staff Association recent donation), and I’m really glad that I did. I got to underline the poetry and the words that really resonated with me. I carefully applied sticky notes to the parts I loved, the difficult areas I wanted to come back to, the short mix of music I have to check out.